All products >> Accessories >> Commuting & Touring >> Racks >> Silver,Rear 26"- 29"
Surly Nice Racks are expedition-quality bicycle racks for extended touring, camping, etc. 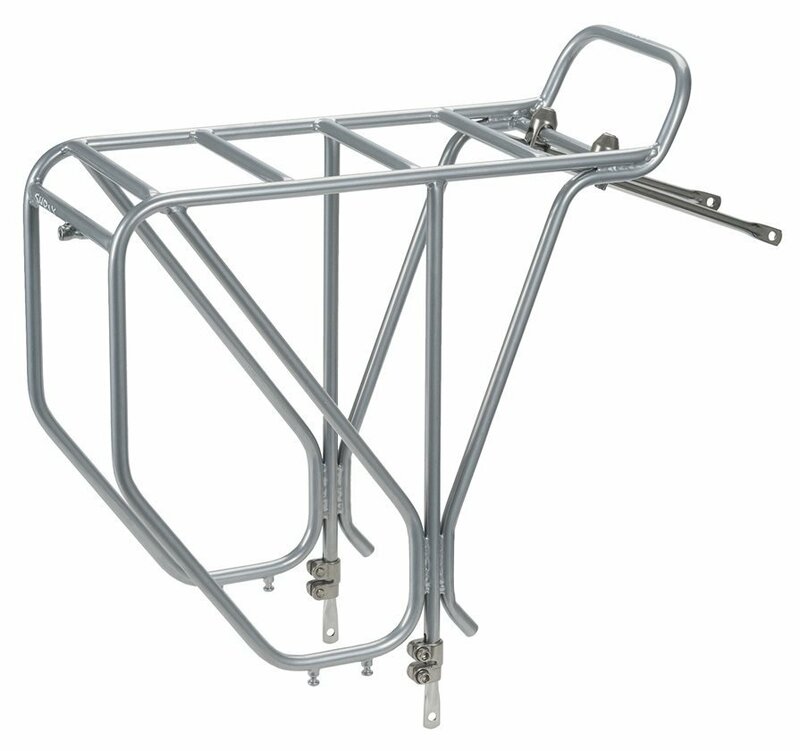 The Surly Rack is made from high quality tubular cromoly steel that is built to take abuse and carry a heavy load. Great for anything from commuting to cross-continental globe trekking, the Surly Nice Rack is so much more than "nice." Incredibly strong chromoly steel construction (most cheap racks are aluminum). In general, these racks dont fit bikes with disc brakes or suspension, with the exception of Surly disc brake compatible bikes (Ogre, Troll, Disc Trucker). Front racks mount to forks with mid-blade eyelets - about 165mm from the dropout. Most quality touring forks have these. Hardware is included to help them fit forks without eyelets. Again, tested on some of the worst "roads" you would ever want to consider. Who cares if they are not super easy to install... you want something that is nuclear proof while in the middle of the mountains. I've used this rack for over a year on my Long Haul Trucker and it has worked flawlessly. It's a little heavy, but they bike isn't really meant to be light. I used both the Front and Rear Nice Racks on a recent tour around Iceland. I got them because they were beefy. I crammed all sorts of stuff on there... they easily held all my camping gear/clothing/food/tools/etc... Probably had more than 30 lbs on my rear rack and then another 20 lbs on my front rack, and I wouldn't have thought twice about adding more weight to them. The other nice thing, and it's subtle, is that the Nice Racks have a solid bar that goes up and over the back tire (closest to where your bike seat is). Hopefully this makes sense... but I was able to use this bar like a handle if I needed to pick up my bike and maneuver it around. The Tubus racks have a "bull horn" style design to the rear rack. Just go look at some interweb pictures you guys will figure out what I mean. Anyway, I used this much more often than I thought and I am convinced that it is a key design element after watching my friend (with Tubus racks) try and pick his bike up to turn around in a tight area. The other nice thing about the Front Nice Rack is that it has a top platform to lash more gear to if you wanted. Again the Tubus don't have this small, but critical, design feature. Surly wins big with this one. Best racks on the planet. I'm in New Zealand and yet my racks arrived from the US faster and in better condition than the tires I had ordered on the same day from a retailer just a few miles away. You people in the US are so lucky with the standard of retail service you have - or maybe it's just Jensons, I don't know. Anyway, sad to say for retailers in my country,but from now on I'm going to buy from Jensons whenever they are selling what I want. Highly recommended. Really solid. It was a tight fit on the stock fork of a Surly Big Dummy with 185mm avid bb7 calipers. Feels great. Hardware included is amazing. I use this on my Surly LHT, my commuter bike. Instead of carrying my messenger bag on my back, I bungie it to the front rack. It does affect the handling of the bike, putting extra weight on the front fork. Overall, great product! I have an assortment of touring bikes with most of the top brand racks. Heel clearance for my size 12's is first priority. Note that the bags will sit slightly to the rear of the center beam of this rack where it attaches to the dropout. This is important for non adjustable bags that use two evenly spaced hooks at the top and a bungy hook on the bottom. Typical of the grocery panniers and light duty commuter bags that get a lot more daily use than my Ortlieb touring bags. A lot of racks will center the bag at the central point of the rack, instead of this slight rearward offset that Surly designed in to give better heel clearance. I have these on two bikes and they're effortless to use for camping, commuting, or grocery runs. I have OMM on other bikes and they are good also but my number 2 choice would be Jandd for heel clearance on the rain bikes at a lower cost. I finally sprung for a Cosmo for my latest bike build... my feet are hitting the bags! Bottom line, the Surly is the best designed rear chromo I have in my assortment. Surly Racks do the job! The Surly Rear rack is wider than my old rack and sits my Panniers way further back than the other one. This gives plenty of clearance for pedalling. Attaching the Panniers is very easy and the Surly Rack seems to be tailor made for touring which is what I wanted. It goes with the Surly Front Rack I have on my Surly LHT. As with the front Rack it appears very stong and made to last! I installed front and rear racks to my Surly Cross Check bike.It might be a little bit difficult to calibrate front rack without reading the instructions. I found that my metal rear fender hit rear rack and made some noisy sounds when I passed ramps on the road.The gap might be too small.I attached small rubber sheets on the fender to reduce this noise. Otherwise, I have no problem with these Nice racks.It help me when I go shopping with my crosscheck bike. I've been perusing front racks for years. But once I saw Surly's rack I knew I had finally found the rack I needed. Their rack is certainly one of the best, largest, most useful front racks on the market. I would say it's like having a rear rack on your front wheel, but its actually better. I end up using my front rack more than my rear, because it is so much better. When they make a rear rack like this front rack, then my bike may finally achieve nirvana. The Surly rear Nice Rack is an excellent addition to my Salsa Fargo, which is my primary long distance trekking machine. The rack is a solid, quality piece of equipment capable of carrying heavy loads in standard panniers. It's each to install and went on without a hitch. The top of the rack leaves plenty of room for strapping on extra gear in addition to panniers on each side. It will be interesting to see how the cromoly stands up to corrosion. It's a little heavier of a rack, but a bombproof build. Highly recommend. Jenson is awesome, fast delivery, well packed and "price to your door" shipping. Thanks Jenson! (if needed) and the rack can take the weight I'll be loading on it. This is a lovely and strong looking pannier rack,although I haven't had the chance to test it out yet it looks as though it will last for years.I bought it as I have a bicycle that's difficult to fit full sized panniers on unless you have a very tall or adjustable rack which can very very hard to get.I previously had a Tortec Ultra light but wanted something stronger and easily repairable.The only things I dislike about this rack are the utterly useless instructions which need a magnifying glass to read,and the assembly requires a lot of patience as it's very fiddly to fit. To be honest had I a normal Touring/Mountain bicycle instead of a recumbent with 20 inch wheels I would have bought a Tubus cargo rack which is just as strong.Also it is much easy to fit with the added bonus of having a proper lamp bracket on the back. This is a great rack, specially if you have a touring bike. I have a Surly Long Haul Trucker, but even then it was not a simple process to install it. How wide are the lower mounts? Approximately 150mm. I have the rack mounted on an older MTB frame with rear hub spacing of 135mm. Had no issues with installation. Will this fit my Surly Wednesday? BEST ANSWER: The rack allows for a lot of adjustment. It should fit several different models. I had it on my LHT. Contact Surley because they can answer your question. I fitted my 14 inch 2014 Pugs Ops, but must be mounted to the inside of the frame on the right side, and to the outside of the frame on the left side. Would this fit a kona Sutra 2015? 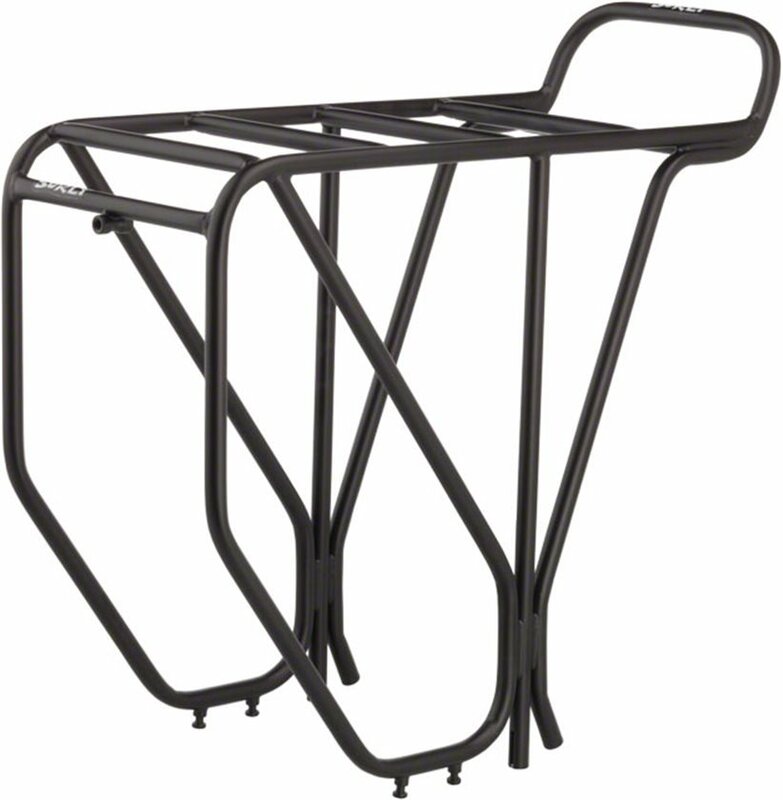 BEST ANSWER: This rack will fit virtually and frame/wheel combo. This is hands down the best rear rack on the market. Will this fit a karate monkey?